AR-15-style rifle: A particularly popular style of semi-automatic rifle, this one is based on the original ArmaLite AR-15, built for U.S. military in the late 1950s, which relabeled it the M-16. Since the expiration of the AR-15 patent, many manufacturers have produced a wide array of similarly designed, modular semi-automatic rifles. 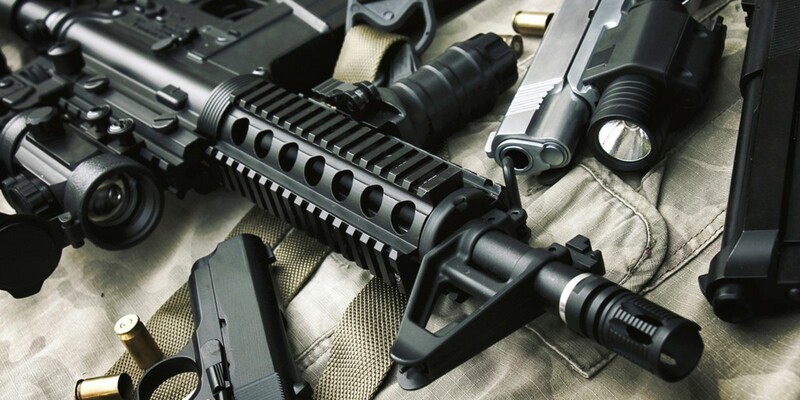 The AR-15 style is among the most popular in the United States. People who aren't gun enthusiasts will likely recognize it as the weapon of choice for mass shooters at San Bernardino, California; Sandy Hook, Connecticut; Parkland, Florida; and Las Vegas, Nevada. Assault rifle: A rifle capable of fully automatic and semi-automatic modes of fire. Based on this definition, federal law prohibits civilians from owning assault rifles manufactured after 1986. However, other definitions are occasionally used. Adding to the confusion, an "assault rifle" is not the same thing as an "assault weapon" (see below). Assault weapon: A nebulous, politically- charged term that dates back to at least 1980. California law offers a wide-ranging definition that encompasses any "semi- automatic, centerfire rifle" with a detachable magazine and at least one of a handful of other features, including a protruding pistol grip or an adjustable stock. This mix and match approach to defining a banned weapon has led to some creative workarounds from gun enthusiasts. But California also explicitly includes a number of makes and models in its ban, including the original AR-15 and other high-powered rifles. Gun control activists argue that the term "assault weapon" is a useful term to describe a weapon with enhanced killing power, while gun rights advocates dismiss it an imprecise catch-all designed to turn the public against any firearm that happens to looks like an assault rifle, regardless of its actual lethality. Bullet button: A magazine release that can only be activated with a pointed tool or the tip of a bullet (hence the name). These devices were invented to convert a firearm with a detachable magazine into a firearm with slightly-less detachable magazines so as to comply with California's assault weapon ban. California includes a detachable magazine as one of the components in its definition of restricted weapons. A 2017 state law effectively closed the "bullet button loophole," meaning that any firearm with the device is still legally considered to have a detachable magazine and therefore, possibly, an assault weapon. Bump Stock: An adjustable rifle stock that uses the force of the firearm's recoil to allow the trigger to be repeatedly pulled. A kind of multiburst trigger activator, this effectively allows a semiautomatic weapon to simulate automatic fire. Bump stocks gained national attention after a shooter used one to kill nearly 60 people and wound hundreds more in Las Vegas in 2017. They are banned by both federal and state law. Cartridge: A unit of ammunition for a firearm that often includes a bullet, primer and propellent (i.e. gunpowder) within a casing. Also called a "round." To reiterate: a cartridge is not a bullet. Casing: The metal container for a unit of ammunition. Sometimes called a "shell." Centerfire: A round-type that, when fired, is struck by the firing pin in the center of the back — used in most modern firearms as the rounds can accept higher power (as opposed to rimfire). Concealed carry license: California is one of eight states that allow civilians to carry a concealed weapon only if local law enforcement agencies decide to give them a permit. 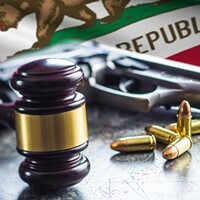 This distinguishes California from "shall issue" states, in which concealed carry permits must be issued as long as an applicant meets the legally specified requirements, and "permitless" or "right to carry" states where no permit is required. Gun Show Loophole: Under federal law, individuals can sell firearms without a license as long as they don't make a living off the trade. These amateur sellers are not subject to federal requirements — namely, that they must conduct background checks on their purchasers. In California, all sales must be conducted through a licensed vendor, closing the "loophole." Handgun: California defines a handgun as "any pistol, revolver, or firearm capable of being concealed upon the person." Also sometimes a "short-barreled rifle or a short-barreled shotgun." Handgun Roster: California law bans the sale or manufacture of any handgun that doesn't meet state safety standards. According to data compiled by the CalGuns Foundation, a gun rights organization, the number of firearms on the list has declined each year since 2013. As of the end of January 2019, there were over 700 models on the list. Magazine: A spring-loaded device used to hold multiple rounds designed to load each round into the firearm's firing chamber with a spring. Some firearms have internal magazines into which ammunition must be manually loaded, while others have detachable magazines which allow for quicker unloading and reloading. Microstamp: Any technology that stamps a unique identifying mark on the round casing when the gun is fired. In theory, this acts like a fingerprint, allowing law enforcement to track an empty shell at a crime scene to a particular gun. California law requires all new semi-automatic pistols sold in the state to include microstamping technology. Gun advocates argue that the technology is untested and prohibitively expensive for manufacturers to implement and that the law is effectively a "backdoor ban" on an entire class of newly manufactured firearms. Pistol Grip: A grip that extends beneath the receiver allowing the shooter to hold and fire the weapon like a pistol (with a straight wrist). Under California law, a "pistol grip that protrudes conspicuously beneath" the weapon can be one of the defining features of an "assault weapon." Receiver: The frame of the gun that houses the firing mechanisms. Under U.S. federal law, this is considered the firearm and regulated as such. As of January 1, all receivers in California must have a state- issued serial number. Unfinished Receiver: The frame of the gun that houses the firing mechanisms, but which lacks a channel or pocket for the gun's firing mechanism. Once those modifications have been made with a drill press or another tool, the receiver is legally considered a firearm (though only legally; additional components are required before it can shoot). Also called "80 percent lower receivers." As of January 1, all finished receivers must be serialized under California. A bill requiring unfinished receivers be registered was vetoed by Gov. Jerry Brown.